If the title suggests to you either a party, or violence, then perhaps this post isn’t for you. If instead you are imagining a blank window filled with text, read on. If you are confused right now, but also strangely curious, you may feel free to read on. More than just prettifying the shell output, colorizing bash instantly adds layers of information to basic commands like ls. The first line says, well nothing, it’s just a label, the hash mark prevents bash from reading the contents of the line. But it doesn’t prevent you from reading it. See? A comment. The second line says “Colorize the command line interface? Why yes!”. And the third says what colors to make everything (believe it or not). If you’d like to tweak the colors yourself a bit, i’d recommend this handy color code generator, because trying to manually adjust the LSCOLORS can be (read: is) maddening. 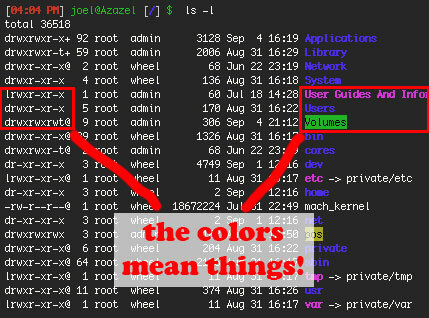 The different colors indicate useful pieces of info about your filesystem. Like this screenshot of my root directory. At a glance i can see file permissions, whether something is a folder, an alias, an executable, and so on. Spending as much time as i do in the terminal, the history feature of bash quickly becomes invaluable. Here are 3 commands i’ve added to my configuration that i find O so helpful! Ignoring the comment line, the first command tells bash to ignore duplicate commands. Really handy if you repeat commands in the shell a bunch, or just for ignoring the ones you type all the time. The second expands the default history file size, i believe the default in OS X is 500 lines. I’ve upped mine to 10,000. 🙂 And finally, the histappend command tells bash to append to the history file on startup, overriding the default behavior which is to overwrite (gasp!). A simple one-liner, but not to be underestimated. Your PATH is the list of directories whose contents are accessible without having to know exactly where the command is kept. I use the command mysql -u root all the time. But i dont really need to know that the mysql executable resides in the directory /usr/local/mysql/bin/ nor do i need to type that every time, because i’ve added that directory to my PATH. Make sense? Add your own, the line is simply a colon-delimited listing of directories, simple. Many thanks to HackADay.com for the idea for this. Whew, this is a big one. Probably deserving of it own article. Here’s is my entire (abridged) .bash_login file. alias mystop="sudo launchctl unload -w /Library/LaunchDaemons/com.mysql.mysqld.plist"
PS1="\`if [ \$? != 0 ]; then echo \[\e[33m\]---=== \[\e[31m\]Oh noes, bad command \[\e[33m\]===---; fi\`\n\[\e[0;37m\][\[\e[1;31m\]\@\[\e[0;37m\]] \[\e[0;32m\]\u@\h \[\e[0;37m\][\[\e[1;34m\]\w\[\e[0;37m\]] \[\e[0;32m\]\$ \[\e[0m\] "
I’d LOVE to hear what other people are doing with their terminals that they find helpful, smart, or fun. Leave a comment and let me know what you know! Thanks for following along everyone who made it this far. You are all getting gold-stars! how about the python shell, or the z shell? Under Puppy Linux, the Bash default colors are crap. The light blue cannot be seen. I found your info by searching on Google. Do not know yet, but I do hope it contains enough info to make the output readable, and now-to-have, in a slightly large size font. Thanks for your efforts.